I ventured on a solo mission last night to Michaels bay to test out the new lures I had custom painted (they are actually a lure (Manitoulin Madness) for sale now on their website) by Epic Fishing Tackle in Sudbury. I arrived at 6 pm at the ramp and I had my game plan already in my head. I knew that this time of year the fish will be moving in closer to the mouth but so will the bait. I motored to the mouth of the bay and decided to fish the west side. 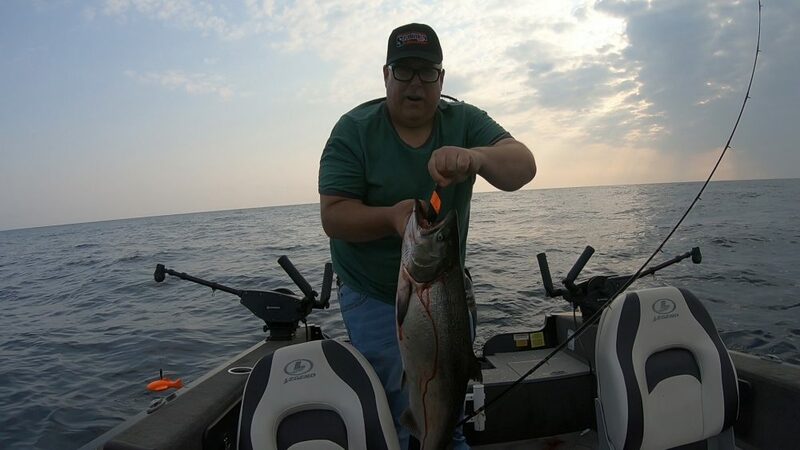 I normally shoot through the narrows between the island and the east point to find deep water but the west side with all the structure normally holds bait in the evenings. Quickly I made it to my first location and found nothing at all. Not even bothering to set up I quickly shot over to Carter Bay and inched my way in 45 fow along the shore looking for bait. Instantly I found what I was looking for in 50 fow and proceeded to set up 35 down. I chose the new custom spoons from Epic and a Dreamweaver MJ on the second rod. The throwback black and white spoon from Epic lasted about 10 mins until it sprang to life with a very solid 16lb chinook. Away went the second rod with the MJ and I decided to just run one rod with the bigger fish lurking around. Not even 15 mins later the lure now known as Manitoulin Madness picked up another chinook, this time it was much bigger than the first. Following a very spunky 10 min battle fish number 2 was in the boat. I had lightly hooked this one and this made for an easy release. The big, roughly, 17lb female went back to the depths. I continued my trolling for another hour or so with a couple of knock-offs and not much else. The bait had disappeared, and it was time for me to reposition and find where it had gone. My first thought was to go shallower, just as the sunsets I generally like to be in 35-40 fow this time of year. I trolled into 35 fow and quickly found my bait balls. I dropped the cannonball to 30’ and ran right through the bait ball. Within 15 seconds the rod sprang to life and I was soon chasing an 18+lber. The salmon put up a terrific battle, hopes of me releasing her were dashed as she had absolutely devoured the lure and was bleeding quite badly. The sun was nearly down so I headed for the launch at Michaels and called it a day.